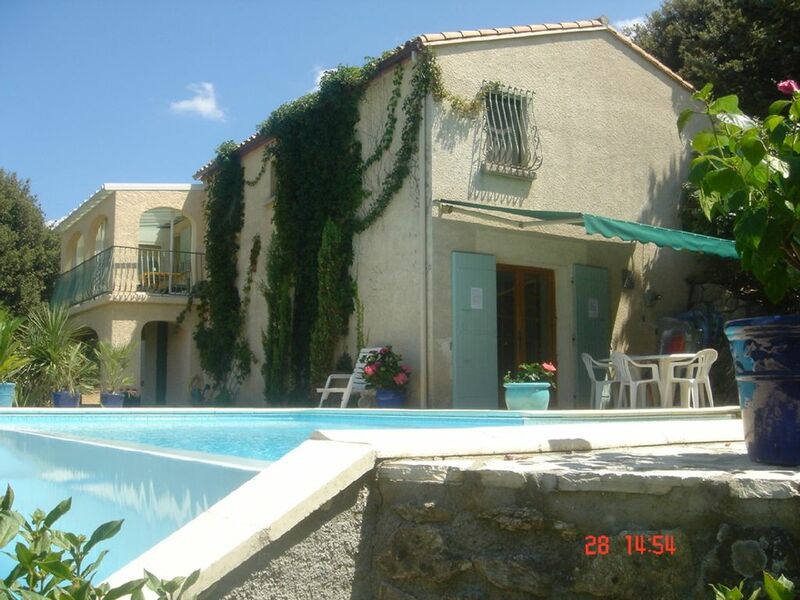 Detached Villa built 1980, Tiled floors, French windows (double -glazed) to every room/bedroom. Elevated position with distant mountain views. Large, secluded, terraced tropical garden approx. 1 acre, (partly wooded) recently constructed L-shaped pool. Private entrance/driveway. Outdoor table-tennis. No passing traffic, immediate access to open country (walking/mountain-biking), 10minutes from delightful traditional French town of Ceret (Saturday market) & Spanish border. 30minutes from Mediterranean, Colliure, Argeles, Banyuls. 90minutes from Pyrenees (skiing in winter).Extensive cultural & recreational facilities nearby yet complete privacy & tranquillity should this be desired. Perpignan airport 40minutes,Gerona 45 minutes, Barcelona 90 minutes. Local amenities: Ceret our nearest town has great charm & character. It was a favourite location for artists such as Picasso, Braque & Matisse the evidence of which can be seen in the small Modern Art Museum in the main square. There is also an Archaeological Museum. There is a large variety of shops & not to be missed is the excellent Saturday morning street market selling local produce, rafts, clothes, occasionally antiques. There are cafes for people-watching Pablo's & the Grand Cafe are popular & a range of excellent restaurants some of which serve traditional Catalan dishes. Tennis & bicycle-hire are also available in town. Perpignan: The nearest large town is a 30 minute drive away. Here one will find an abundance of sophisticated shops, restaurants & bars, cinemas & concert venues. It seems that rarely a week goes by without there being an arts festival of some description, be it music, drama or merely to celebrate the cherry or grape harvest! The Coast, Spain & Mountains. : The coastal resorts of Argeles, St.Cyprien are also about 30minutes drive & each have long sandy beaches & in parts a very busy seaside atmosphere. There is a large Aqua Park & Go-Karting in St Cyprien. Further south, close to the Spanish border there are the picturesque harbours of Collioure, Banjuls & Port Vendres. Spain(20minutes drive) has some excellent duty-free shopping & it is little more than 1 hour to Figueras, & the Costa Brava, with Barcelona 1.5hours. The Pyrenees are very close by & for the keen walker the trekking is limitless. For the less-energetic 4-wheel-drive excursions can be arranged. Skiing in winter is easily accessible at les Angles & Andorra. The villa is situated in the hills above the delightful picturesque town of Ceret. The house is a 10 minute drive from Ceret & spectacular sea & mountain views can be enjoyed on the drive down. The villa is reached through its own gated entrance & a private drive leads to a large parking area. On a lower level within the part-terraced gardens there is an all-weather table tennis table adjacent to a large workshop. The pool has its own pool house & there are a number of sun loungers & outdoor dining table & chairs + parasols etc. The large double-height reception room has a covered balcony overlooking the pool & an additional terrace leads to a stone built barbecue. The fully-fitted kitchen is equipped to provide for at least 8 people. 2 bedrooms are situated on the upper floor, 2 on the lower, all being newly furnished. There is a separate laundry room with washing machine, tumble drier & additional freezer.